Definition at line 29 of file ResponseParser.h. Definition at line 37 of file ResponseParser.h. Definition at line 40 of file ResponseParser.h. References firstLineSize(), parse(), and ResponseParser(). Referenced by Http::ContentLengthInterpreter::goodSuffix(), Http::One::RequestParser::parseMethodField(), Http::One::RequestParser::parseRequestFirstLine(), parseResponseFirstLine(), and Http::One::RequestParser::RequestTargetCharacters(). Definition at line 20 of file ResponseParser.cc. References Http::One::Parser::Http1magic, IcyMagic, SBuf::length(), AnyP::ProtocolVersion::minor, Http::One::Parser::msgProtocol_, AnyP::PROTO_HTTP, AnyP::PROTO_ICY, AnyP::ProtocolVersion::protocol, and reasonPhrase_. References SBuf::caseCmp(), SBuf::chop(), SBuf::consume(), Http::One::CrLf(), debugs, GET_HDR_SZ, Http::One::Parser::headerBlockSize(), CharacterSet::LF, LineCharacters(), LOCAL_ARRAY, Http::One::Parser::mimeHeaderBlock_, NULL, p, SBufToCstring(), SBuf::substr(), SBuf::trim(), and CharacterSet::WSP. References Http::One::Parser::buf_, Http::One::Parser::cleanMimePrefix(), SBuf::consume(), debugs, Http::One::Parser::firstLineSize(), Http::One::Parser::hackExpectsMime_, headersEnd(), Http::One::HTTP_PARSE_DONE, SBuf::length(), AnyP::ProtocolVersion::major, Http::One::Parser::mimeHeaderBlock_, Http::One::Parser::msgProtocol_, Http::One::Parser::parseStatusCode, Http::One::Parser::parsingStage_, AnyP::PROTO_HTTP, AnyP::PROTO_ICY, AnyP::ProtocolVersion::protocol, Http::scHeaderTooLarge, and Http::One::Parser::unfoldMime(). Referenced by Http::One::RequestParser::doParse(), parse(), and Http::One::TeChunkedParser::parse(). Referenced by Http::One::Parser::getHeaderField(), Http::One::Parser::messageHeaderSize(), and Http::Message::parseHeader(). Definition at line 45 of file ResponseParser.h. References Http::One::Parser::firstLineSize(), Http::One::HTTP_PARSE_DONE, and Http::One::Parser::parsingStage_. Referenced by Http::One::RequestParser::doParse(), parse(), Http::One::TeChunkedParser::parse(), Adaptation::Icap::ModXact::parseBody(), Http::One::TeChunkedParser::parseChunkBody(), testHttp1Parser::testDripFeed(), testHttp1Parser::testParserConstruct(), and testResults(). Definition at line 186 of file ResponseParser.cc. References Http::One::Parser::buf_, Config, DBG_DATA, debugs, Http::One::Parser::grabMimeBlock(), Http::One::HTTP_PARSE_DONE, Http::One::HTTP_PARSE_FIRST, Http::One::HTTP_PARSE_MIME, Http::One::HTTP_PARSE_NONE, SBuf::isEmpty(), SBuf::length(), SquidConfig::maxReplyHeaderSize, Http::One::Parser::msgProtocol_, Http::One::Parser::needsMoreData(), parseResponseFirstLine(), Http::One::Parser::parseStatusCode, Http::One::Parser::parsingStage_, PROF_start, PROF_stop, reasonPhrase_, Http::scInvalidHeader, and statusCode_. Attempt to parse the method field out of an HTTP message status-line. Parsing state is stored between calls. The current implementation uses checkpoints after each successful status-line field. The return value tells you whether the parsing is completed or not. 1 successful parse. statusCode_ and maybe reasonPhrase_ are filled and buffer consumed including first delimiter. Definition at line 119 of file ResponseParser.cc. References Http::One::Parser::buf_, DBG_DATA, debugs, Http::One::Parser::DelimiterCharacters(), Http::One::Parser::Http1magic, Http::One::HTTP_PARSE_DONE, IcyMagic, SBuf::length(), AnyP::ProtocolVersion::major, Http::One::Parser::mimeHeaderBlock_, AnyP::ProtocolVersion::minor, Http::One::Parser::msgProtocol_, parseResponseStatusAndReason(), Http::One::Parser::parsingStage_, AnyP::PROTO_HTTP, AnyP::PROTO_ICY, AnyP::PROTO_NONE, AnyP::ProtocolVersion::protocol, Http::ProtocolVersion(), reasonPhrase_, Http::scOkay, and statusCode_. Referenced by parse(), and reasonPhrase(). Definition at line 50 of file ResponseParser.cc. References Http::One::Parser::buf_, SBuf::clear(), completedStatus_, DBG_DATA, debugs, SBuf::length(), CharacterSet::OBSTEXT, SBuf::rawContent(), reasonPhrase_, Http::One::Parser::skipLineTerminator(), statusCode_, CharacterSet::VCHAR, and CharacterSet::WSP. Referenced by parseResponseFirstLine(), and reasonPhrase(). Definition at line 46 of file ResponseParser.h. References parseResponseFirstLine(), parseResponseStatusAndReason(), and reasonPhrase_. 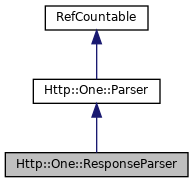 Referenced by Http::One::TeChunkedParser::parseChunkEnd(), Http::One::TeChunkedParser::parseChunkMetadataSuffix(), and parseResponseStatusAndReason(). Referenced by Http::One::Parser::clear(), Http::One::TeChunkedParser::clear(), Http::One::RequestParser::doParse(), Http::One::Parser::grabMimeBlock(), parse(), Http::One::TeChunkedParser::parse(), Http::One::TeChunkedParser::parseChunkBody(), Http::One::TeChunkedParser::parseChunkEnd(), Http::One::TeChunkedParser::parseChunkExtensions(), Http::One::TeChunkedParser::parseChunkMetadataSuffix(), Http::One::TeChunkedParser::parseChunkSize(), Http::One::RequestParser::parseRequestFirstLine(), parseResponseFirstLine(), parseResponseStatusAndReason(), Http::One::Parser::remaining(), Http::One::RequestParser::skipGarbageLines(), testHttp1Parser::testParserConstruct(), and testResults(). Whether we found the status code yet. We cannot rely on status value because server may send "000". Definition at line 57 of file ResponseParser.h. Referenced by firstLineSize(), and parseResponseFirstLine(). Definition at line 53 of file ResponseParser.h. Referenced by Http::One::Parser::cleanMimePrefix(), Http::One::Parser::clear(), Http::One::Parser::getHeaderField(), Http::One::Parser::grabMimeBlock(), Http::One::Parser::headerBlockSize(), Http::One::Parser::mimeHeader(), parseResponseFirstLine(), and Http::One::Parser::unfoldMime(). Referenced by Http::One::Parser::clear(), Http::One::RequestParser::doParse(), firstLineSize(), Http::One::Parser::grabMimeBlock(), Http::One::Parser::messageProtocol(), parse(), Http::One::RequestParser::parseHttpVersionField(), parseResponseFirstLine(), Http::One::TeChunkedParser::TeChunkedParser(), testHttp1Parser::testParserConstruct(), and testResults(). Referenced by Http::One::RequestParser::doParse(), Http::One::Parser::grabMimeBlock(), parse(), Http::One::RequestParser::parseHttpVersionField(), Http::One::RequestParser::parseMethodField(), Http::One::RequestParser::parseRequestFirstLine(), Http::One::RequestParser::parseUriField(), Http::One::RequestParser::skipDelimiter(), Http::One::RequestParser::skipTrailingCrs(), testHttp1Parser::testParserConstruct(), and testResults(). Referenced by Http::One::Parser::clear(), Http::One::TeChunkedParser::clear(), Http::One::RequestParser::doParse(), Http::One::Parser::grabMimeBlock(), Http::One::Parser::needsMoreData(), Http::One::TeChunkedParser::needsMoreSpace(), parse(), Http::One::TeChunkedParser::parse(), Http::One::TeChunkedParser::parseChunkEnd(), Http::One::TeChunkedParser::parseChunkMetadataSuffix(), Http::One::TeChunkedParser::parseChunkSize(), parseResponseFirstLine(), testHttp1Parser::testParserConstruct(), and testResults(). Definition at line 63 of file ResponseParser.h. Referenced by firstLineSize(), parse(), parseResponseFirstLine(), parseResponseStatusAndReason(), and reasonPhrase(). Definition at line 60 of file ResponseParser.h. Referenced by messageStatus(), parse(), parseResponseFirstLine(), and parseResponseStatusAndReason().